WHEN THE BEAR TRIPS, HOW HARD DOES IT FALL? Investors will remember that we have been nagging them about the coming correction. Now that it’s here, the big question is how bad will it be. History is a good guide because, as Warren Buffett has pointed out, Mr Market keeps making the same mistakes, swinging from over-optimism to extreme pessimism and back again. The main driver of the US share market since the GFC has been the technology sector, headed by stocks such as Facebook, Apple, Amazon, Netflix, and Google (aka Alphabet). These FAANGs now constitute a very material part of the market capitalisation of the S&P500, as the pie chart below shows. 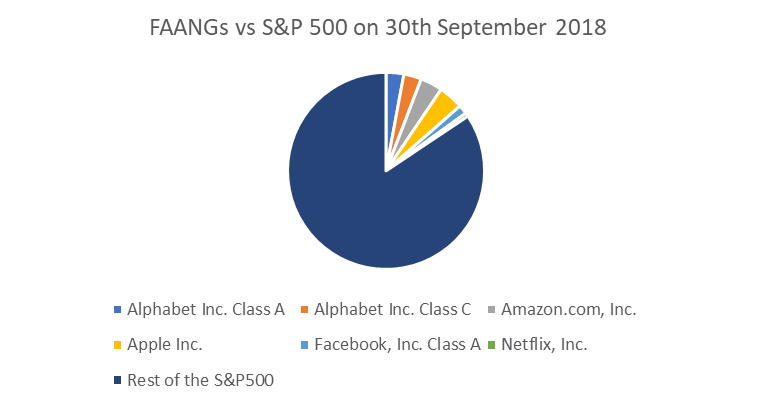 However, by late September 2018, all of the tech stocks in the S&P500 (not just the FAANGs) accounted for approx. 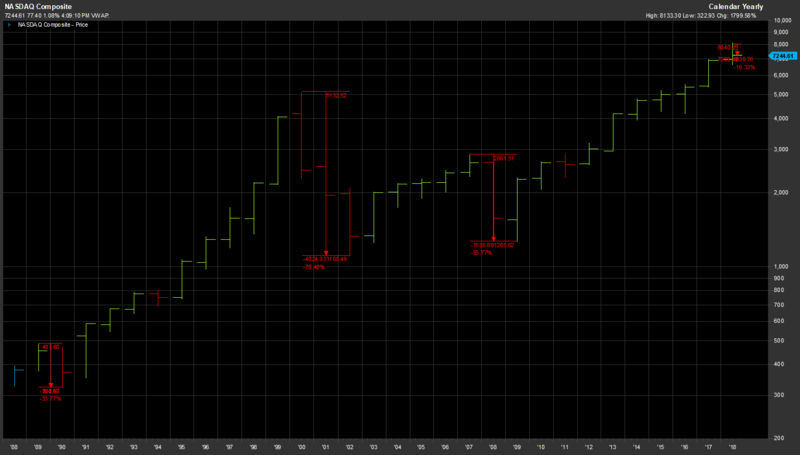 25% of the value of the S&P500 index. We can summarize the price volatility of tech stocks by looking at the Nasdaq Composite index, which is over 80% composed of tech stocks. In the wake of the GFC, the Nasdaq fell by -55% over a year and a half. After the dotcom boom, the Nasdaq fell -33% between March and May 2000, finally bottoming out at -78% down in October 2002. (As a current comparison, the three biggest Chinese tech giants, Baidu, Alibaba, and Tencent, have fallen by an average of -35% in the last nine months.) If we assume that the tech stocks in the S&P500 will fall by -44% from their recent peaks, that implies an -11% fall in the S&P500 – assuming that the other 75% of the S&P500 doesn’t move. NASDAQ: The highs to lows of tech in “recent” times ie. the last 30 years (log scale chart). We recall that the S&P500 index fell by 51% after the GFC, but this was far from its worst bear market – it fell by 83% in the three years after the 1929 Crash. Looking at the historical declines of the S&P500 since 1926, the smallest fall was 21% and the average was 41%. If we assume the other 75% of the S&P500 falls by only 21%, that implies a 16% fall in the index (other things being equal). Putting these two calculations together we get a total fall of 27% from peak to trough. The S&P500 has already fallen -8.8% in the last month, leaving another -19% downside, provided that our calculations are not too optimistic. Looking at the current correction from a fundamental viewpoint, we do not expect the US share market to drop as far as the 50.9% which it managed during the GFC. There are important differences in the chain of events this time around. The GFC was triggered by the collapse of a US housing bubble whose effects were magnified throughout the global financial system by ignorant ownership of murky securities and dangerous derivatives. In essence, falling asset values exposed the high leverage and weak balance sheets of many banks and shadow banks. In 2018, there is no housing bubble, while most banks have strengthened their balance sheets and improved their risk controls. This time around, the biggest problems will emerge in the bond market, particularly US corporate bonds, as well as government bonds from developing countries. The low interest rate environment which has been in place since the GFC is coming to an end. All capital markets are feeling how global liquidity is tightening. 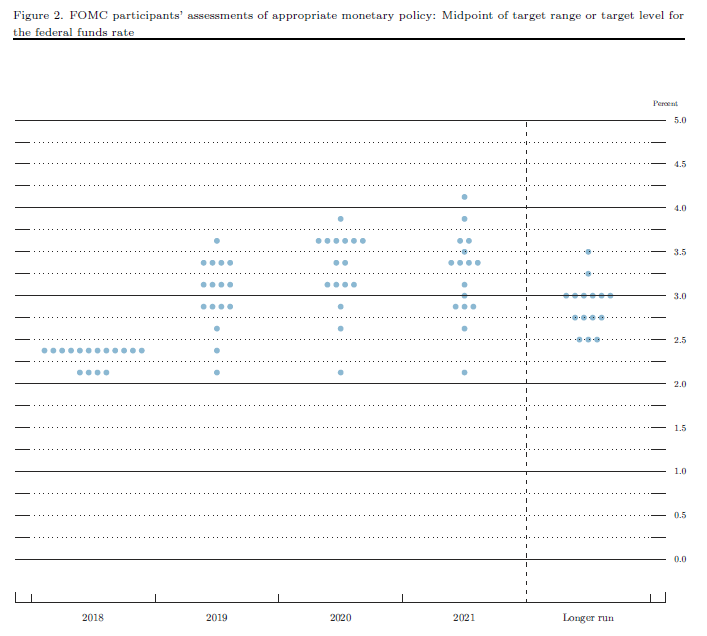 The US Federal Reserve is visibly raising the official cash rate, which has gone from zero to 2.25%, and as the chart from the Fed below demonstrates, is expected to pass 3.0% by 2020. The Fed has also reversed its policy of quantitative easing (QE), so that it is now a net seller of US bonds at a time when the US Federal Government deficit is doubling. Higher interest rates will mean that corporate funding costs will rise, putting many highly geared companies at risk of defaulting on their bonds. Ray Dalio, founder of the USD$160 billion hedge fund group Bridgewater, has recently forecast a US debt crisis in about 2020, based on exhaustive historical modelling. We do not disagree with his analysis, but we note that such a crisis has relatively limited impact on Australia, because Australia is economically closer to China. Just as the US rose further and faster than Australia after the GFC was over, so it will sink deeper in the coming bear market. The Arminius Capital ALPS fund has successfully shorted a number of US tech stocks in October 2018. We believe that there are further falls ahead, concentrated in the US tech sector but that will spread to the broader index, which will validate our bearish outlook and short positions. We continue to warn that passive long only investments may indeed bear fruit over 100 year periods, but this can only come with market drawdowns, at times severe, across a century of investing. And not all bulls live to 100.